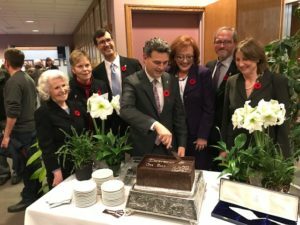 After a hectic municipal election campaign that wound up on October 20, 2018, election day, Oak Bay voters elected a new Mayor and Council. I was gratified to be among the seven candidates elected and am deeply grateful to Oak Bay voters for their support, awarding me over 3,800 votes and giving me the privilege to serve Oak Bay Council and the community again. Oak Bay made wise choices and elected a group of candidates who, as Councillors, are ready to get to work on behalf of our community. Public expectations are high (and so are mine) for a productive and meaningful four-year term ahead — I look forward to the future of this Council with optimism and enthusiasm. In his Inaugural Speech on November 5, 2018, Mayor Kevin Murdoch talked about inclusion, the importance of partnerships and his focus on meeting commitments made during his campaign. For the first time in recent history, the Mayor invited each Council member to also say a few words at the Inauguration, a new tradition that was welcomed. Heralding a new tone and culture of cooperation, as well as “shared leadership,” a model that I talked about and supported during my campaign, the first few months of this new Council reflect some new practices; the public and staff are no longer required to stand as Mayor and Council come into the Chamber, the Mayor welcomes and encourages public participation and the home page of the municipal website has a photo that features all seven Council members. These may seem like smaller changes but I believe that, taken together, their impact is bigger. In addition, after bringing my request forward to staff, I am pleased that our agenda format has recently changed to make items more readable and clear — “understanding at a glance.” My thanks to Deputy Director of Corporate Services Deb Hopkins for her suggestions and hard work to get this done early in the new year. Council and Committee meetings also occur in a distinctly improved atmosphere of mutual respect and support. Municipal staff, under the leadership of Chief Administrative Officer Lou Verela, have been helpful to Council during this phase of “settling in.” Noteworthy is, that for the first time, a made in Oak Bay Council two-day orientation took place that included the senior/management leadership team, Council members and a facilitator. The time we spent together was valuable and helped to form relationships with one another in a more informal setting. While the first six months of a new Council can be a steep learning curve, especially for the newly elected, I am reminded that following an election, all Council members, new and returning, must quickly adapt and learn together as they prepare for a new term. So far, so good; in my view, we are a committed group, wanting to make a real difference and to arrive at meetings well prepared and informed. I am pleased that public feedback to date has been largely positive about this new Council’s performance. These “extra-curricular” activities provide opportunities to see our community and region more broadly beyond the Council table. I will be reporting out at the end of each year, in a written report, a summary of my involvement in each of these groups. A new year brings a re-commitment to planning ahead, to ensure that Council priorities and corporate goals are aligned. Our strategic planning sessions commenced on January 24, 2019 with a first session on Asset Management, a key theme in last fall’s election campaign. On January 29, 2019, the second session focussed on housing, another key theme identified by residents as a call to action. The next session, titled New Initiatives, will be held later this month, tentatively on February 23, 2019, from 6:00 to 9:00 p.m. All meetings will be held in Council Chambers, unless otherwise indicated. Budget discussions commence on March 28, 2019, with a public open house from 6:00 to 8:00 p.m. On April 3, 2019, beginning at 5:30 p.m., the next meeting will focus on Parks, Recreation & Culture. A budget overview and departmental budgets will be presented on April 10, 2019 beginning at 5:30 p.m., followed by a continuation of departmental budgets and referred items on April 17, 2019 beginning at 5:30 p.m. On May 6, 2019 at 6:00 p.m., there will be a Special Council meeting for Bylaw readings, followed by adoption of Bylaws on May 13, 2019 at 7:00 p.m. It is possible that some of the above times and dates may be subject to change so please visit the municipal website to keep updated on any possible changes. I am happy to be part of this Council and I look forward to working together with my colleagues, staff and the community to deliver on some of the important issues that the last election identified. I can also assure you that all of us seem united in one goal, that we ACT on and achieve the goals and priorities that continue to build and enhance our community; aspirational perhaps because there is a lot of work ahead of us but I sense support among Council and staff for realistic goal-setting and action planning during this term.